Are you having issues with sleeping? Do you wake up everyday and feel like you didn't sleep at all? Is your performance struggling even though you're following your program perfectly? Do you actually know how much sleep you should be getting and why? 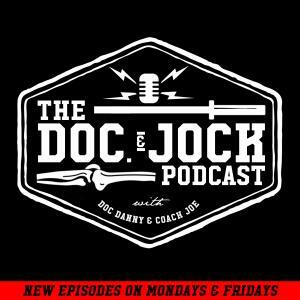 On Episode 184 of the Doc and Jock Podcast we catch up with Doctor Jeffrey Durmer who is one of the world's leading experts on sleep and he answers pretty much every question you have about sleep. Dr. Jeffrey Durmer is a neurologist, systems neuroscientist and board certified sleep medicine physician with particular expertise in technology enabled sleep-health delivery systems. As one of the nation’s leading experts in applying the neuroscience of sleep and circadian rhythm biology to workplace fatigue and wellness programs, he has had the opportunity to work with many different industries and organizations to address the unique problems confronting these populations. His focus is to help people along their path of holistic well being by ensuring they receive the best care that science can provide. •The SCN (super cosmetic nucleus) and how urbanization and technology are driving everyone crazy by killing out sleep density. •Anti-inflammatory response and growth hormone production during sleep. •Circadian rhythms and how wake up times are more important than hours spent sleeping. •It's not about how much sleep you have, it's about how much wake you have. •How lack of sleep makes your teenager crazy. •How sleep deprivation kills your hormonal regulation and production which can cause your metabolic system to shut down, which will make you fat. •Why coach Joe tries to kill rats in his sleep. •Sleep medications: should they be used or not? •Why being a patient scientist always makes you the best patient.